Condoms are an essential for any stag do or bachelor party. 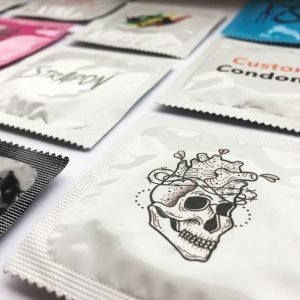 We make it easy for you to get your own design custom printed directly onto a condom packet! Organising your best mate’s stag? Add a classy touch to the weekend with a personalised set of custom condoms. 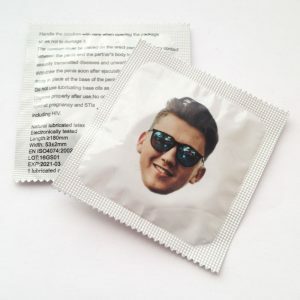 With our easy-to-use online design tool, you can add your own text and images, and we’ll print it onto condom packets. Our minimum order quantity is only 6 pieces. If there’s less than 6 people going on the stag do, that’s just sad. At least you’ll have a couple spare. If it’s a larger group, then you’re in luck: save money by buying larger quantities. Full pricing is available on the designer page. What kind of monsters do you think we are? Of course they’re safe to use. All of the condoms we sell are CE approved and meet all legal requirements. Look, we’ve seen it all. Whatever weird in-joke you want printing, we’ll print it. So long as it’s not illegal or some kind of hate crime. We’re based in the UK, so out of the goodness of our hearts we offer free UK delivery. For the rest of the world planning a ‘bachelor party’, delivery starts from just £3.99.